The judges felt this game stood out in terms of sophistication and production values, with well-crafted graphics and addictive gameplay. 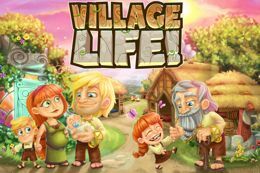 "Village Life mobile is an iOS version of Playdemic's Facebook hit Village Life, creating a full cross-platform experience to allow players to look after their villagers on Facebook, iPhone and iPad. In Village Life, players nurture their villagers from birth, taking care of their needs and guiding them through life’s big events including first date, marriage, childbirth and old age. Village Life is the first social game where characters look to have relationships and children with other players’ villagers, inheriting their parents’ skills. The game is free to play, but also offers the ability to use in-app purchases." This simple, slow-moving, but beautiful and surprisingly deep alternative to the conventional real-time shooter wowed the judges with its effortless beauty. Eufloria was originally released as a PC game, but the judges felt it comes into its own on mobile platforms. Multiple award nominated Eufloria HD is a beautifully styled, incredibly addictive game of space exploration and conquest that avoids all genre clich’©s and employs surprising themes of plant growth and bio-mechanical evolution. Tiny Invaders delivered a polished game that was immediately addictive, fun to play for any age group, and intuitive to learn. As a self-funded and self-delivered game, it's a triumph both for the team behind it, and for independent game development in the North. Tiny Invaders is an intuitive and nimble-fingered action puzzler for touch screen devices. Set in the microscopic world of the human body you control a crazy band of tiny space germs sent from outer space to take over the world! You're tasked with discovering the quickest path through 75 body themed levels to jump from host to host and finally spread your tiny alien invasion to the President of the United States himself. Featured by Apple in their iPhone 4S announcement and as a benchmark game on the App Store Tiny Invaders continues to win many fans the world over. Koko Digital with Zombies Ate My Phone! In September 2011, Phones4U launched their “Missing our deals will haunt you!” campaign, made up from quirky horror themed TV commercials & ads. The brief was to extend this theme in the form of an online game, with the aim to increase brand awareness, social engagement, and to support data capture. The result is titled Zombies Ate My Phone. With a light version designed to go viral, and a Facebook version fully integrated into the brand's Facebook page, the game has gone on to receive a whopping 5 million hits since October 2011. Entrants in this category should demonstrate how the use of gaming - for example a mobile or viral game, or game-style rewards in a campaign - has improved the ability of a business or other organisation to achieve its objectives. 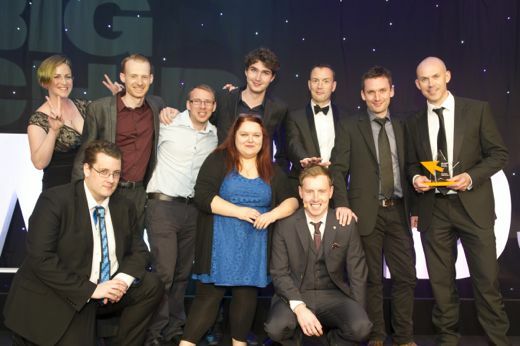 Best Use of Gaming is a new award category in 2012. Previously the Game of the North was aimed solely at games designed to be played for their own sake rather than an application of gaming for a different objective. This year's winner was truly hard to find fault with. It delivered a slick, polished game with superb graphics and game play, with the judges describing it as a top quality piece of work. Hockey Nations 2010 is a fast-paced and fun game that recreates the excitement and strategy of ice hockey on the small screen. The game features 14 international teams across 5 game modes wrapped up in smooth 3D graphics and realistic motion-captured animations. As the first full 6 on 6 Ice Hockey simulation released across key smartphone platforms, Hockey Nations 2010 was immediately embraced by the hockey fans and gamers alike across the globe. The continued success has enabled Distinctive to work closely with the fans to maintain its status as the #1 choice for international hockey gaming on mobile. The winning game was a unanimous hit with the judges, due to its addictive game play, cute graphics and novel concept which perfectly matched its chosen platform. Fire Boris the spider around the screen, connect the pins and make a web. Then watch as the flies whiz past and get caught in the web. The better the web, the more flies you'll catch. It isn't rocket science, but it's a lot of fun! You will find Arachnadoodle hard to put down and as you spin your way through its 32 levels you'll encounter all sorts of obstacles in your quest for flys. With 32 rooms, over eight houses to explore you will be spinning webs for a very long time to come. The judges set a minimum standard for shortlisting any Big Chip category and felt only one of the game entries met this standard. That does not mean however that they will make this entry a winner. The judges chose the winner here out of a very high quality line up mainly because it really pushed the boundary not only in graphical terms but in terms of effects, gameplay, connectivity and how they have taken the franchise forward. The game is so much more than a sequel with more immersive gameplay, lots more courses, loads of new features and a much more balanced game. 16 multi-route, multi-surface race tracks. 336 vehicles to unlock and race. An entry that was great to play on the platform they built it for.